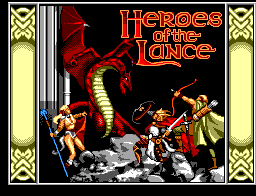 Heroes of the Lance is an action game originally released in 1988, and eventually ported on twelve different platforms between 1988 and 1991. It is the first video game in the Dragonlance series, and in particular the first game in the Silver Box trilogy. Note that, despite the "Dungeons & Dragons" label, despite being officially based on the first Dragonlance role-playing module, and despite featuring experience points, Heroes of the Lance is absolutely NOT a role-playing game. In fact, the majority of the box artworks states clearly: "A Dragonlance action game". 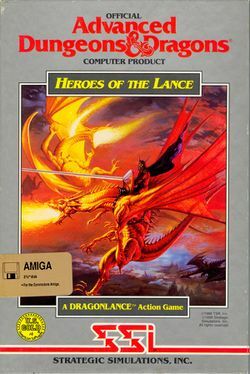 Heroes of the Lance is based on the second half of the Dragonlance role-playing module Dragons of Despair, and on the corresponding chapters 15-22 of the novel Dragons of the Autumn Twilight. Goldmoon and Riverwind were members of the Que-Shu tribe. In order to prove his valor and earn the right to marry Goldmoon, Riverwind went on a quest and returned with the magical Blue Crystal Staff, as a gift for his beloved. Still, her father refused, and the two were cast out of the tribe. Goldmoon soon found out that the Blue Crystal Staff granted her the magic powers of a cleric. They met a group of six companions (Tanis, Flint, Sturm, Tasslehoff, Raistlin and Caramon), and they decide to join forces. Shortly later, an unicorn charged the "Bearer of the Staff", that is Goldmoon, with the quest of retrieving the magical disks of the goddess Mishakal from the ruins of Xak Tsaroth (it can be pronounced "xaxaroth"). Obviously, all the seven males followed her. Note that the most popular ports are different from the one with the most advanced graphics. This page was last edited on 9 May 2018, at 18:00.